Hünkarim is a very attractive bar/restaurant decorated in a Turkish style but offering an amazing selection of Lebanese and Eastern Mediterranean dishes - the speciality of the house is whole roasted stuffed lamb. The atmosphere is relaxed and the menu offers something for everyone, including fresh fish, and is very reasonably priced - two course lunch for only £5.50. Hünkarim is truly an oasis for all occasions with a belly dancer and live music Friday, Saturday and Sunday. Open every day 12noon-midnight. All major credit cards accepted (not Amex/Diners). 10% service charge on parties of 6 or more. 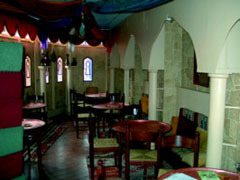 An oasis for all occasions - serving a mixture of Mediterranean and Middle Eastern dishes.